You know I’ve only been in Leap in Ireland for about a year now, and I had a lot of adjusting to do. I went from a cheap apartment in Boston and a dead-end job (the latest of many) to living in Ireland and owning a pub (which before I would have called a bar) and a home of my own, almost overnight. You can see why it took me a while to figure out which end was up. Now I like it. But if I thought I had things figured out, I was wrong. Ireland is not a pretty picture book full of rainbows and fields of fluffy sheep. It is a real country, and like most modern countries, it changes with the times. Sure, some things stay the same, and it’s still beautiful, with a lot of green space (and cows). The people are great—they were really welcoming when I showed up out of nowhere. And the pace of life here is kind of slower than in the States, particularly in cities like Boston, which was all I knew. I know there’s big business around Cork, like pharmaceuticals and electronics, but drive a few miles and you’re in open country again. It takes getting used to. But things don’t say the same, and that’s true even in my little village. For one thing, some big company has bought the grand old hotel outside of Skibbereen, and they want to know if I’d like to partner with them—kind of provide a “real” music experience for their guests. I’ll have to think about that, because I’ve only just figured out how things work as they are, and I don’t want to change anything just to be a tourist attraction. Then there’s Rose, who’s seventeen now, and who deserves a better life than handing out drinks. She’s beginning to look around at other things, and I think she really wants to be a chef, if that’s not too fancy a word. I’d hate to lose her, but I want her to have the life she deserves. And then there’s Mick . . . Things are kind of changing between us, but I’m not sure how or why. I don’t want to deal with a relationship right now, and I’m not sure he does either, but something’s going on with us. I guess if it happens, it happens. I have to say that all these changes have been good for me. I’m not the confused (and I guess angry) person I was when I got here, and I figure I can handle whatever comes next. 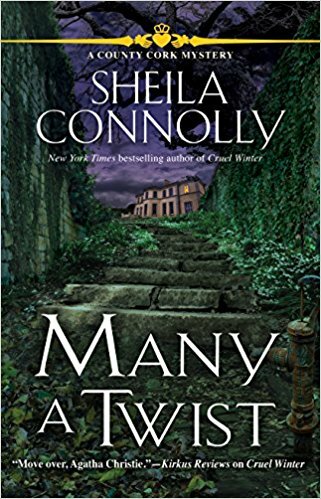 In the sixth County Cork mystery, Many a Twist, a lot is changing, and there are some surprises, but you’ll have to wait until it’s released in January to find out what’s happening with Maura. I love books set in Ireland. This sounds like a really good one. Thank you for the chance. I am very anxious to get started on this series now that my two cataract surgery are done and books are possible much more easily now. Sounds great. So anxious!!! I'm glad your cataract surgery went well. My husband will be having in in a couple of months. I have so much fun "researching" this series, which consists of talking to lots of people about odd things like lightbulb bases. Having cataract surgeries was the best thing I've done for myself in years! The biggest surprise for me was not how much better I could see, but the brightness of colors! Love Maura and her adventures. 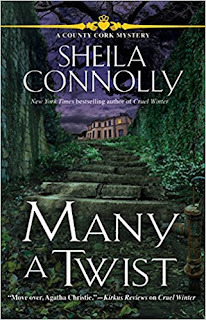 I really like books set in Ireland. I am looking forward to reading this series. I love this series and can't wait for Many a Twist. I've already pre-ordered it for my Kindle. I adore this series! Fingers crossed. bobwiesmann (at) gmail (dot) com. I love this series. My mental picture of Ireland was set in 1950's movies. These books give me a glimpse of today's Ireland. The characters became family from the first book. This one sounds great. Change is a complicated thing. Thank you so much for the chance to win! Thank you for the chance to win a book! I'm really looking forward to this new one. Love this series! Thanks for a chance to win the newest book in the series. Sounds like an interesting story. Thanks for the giveaway. I love this series & have enjoyed experiencing Ireland thru Maura. Would really like to read. Love the Irish setting, sounds like a great read. Would love to read! Thanks! I'd love to in this book so I could "travel" back to Ireland again. Can't wait to read what is happening in Maura's life. Thanks for the chance to win a copy! This sounds like a must read for me. Thank you. I haven’t read this series yet but love your other books. Thank You for the chance!! Sounds great, I'd love to read it. I'd love to read Many a Twist and find out what’s happening with Maura. I do love this series, can't wait to read the book! Thanks for the giveaway...whoever wins will be a lucky reader.